the letters of intent to create the NIU-RVC Engineering Program. Starting next fall, engineering students from the Rockford area can earn bachelor’s degrees and master’s degrees from NIU without leaving the campus of Rock Valley College. Presidents and other leaders of both institutions made the announcement and signed letters of intent this morning before a standing-room-only and energetic crowd gathered inside the Woodward Technology Center. Words including “historic,” “transformational,” “momentous” and “game-changer” were ascribed to the new partnership, which the panel of educators, manufacturers, local and state elected officials and community leaders expects will help to drive Rockford’s economy. Baker called the collaboration “a great day for Northern Illinois University and Rock Valley College,” one that will make it easier for future engineers to achieve their dreams. Delivery of NIU College of Engineering and Engineering Technology classes in Rockford will offer an affordable, convenient and high-quality education, Baker said, along with experiential learning and a vibrant network of employers and jobs. 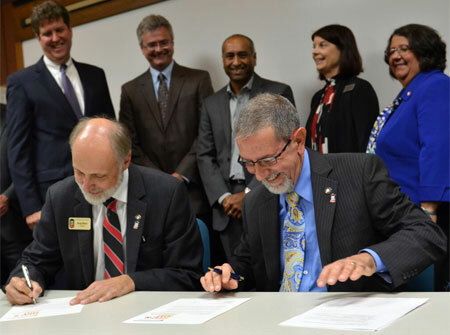 Rock Valley College President Mike Mastroianni – “an amazing ally,” Baker said – said the NIU-RVC Engineering Program will create a workforce of highly motivated, excellently prepared engineering graduates with deep roots in the community. Engineers of tomorrow first must earn an associate degree in Engineering Science from RVC; Step Two is to earn a bachelor’s degree in mechanical engineering, electrical engineering or applied manufacturing. People who already have bachelor’s degrees in engineering can pursue a Master of Science in Industrial and Systems Engineering. Construction of a sustainable pipeline of talent will not only meet the needs of the region’s thriving manufacturing economy but attract other companies to locate operations and create jobs there as well. 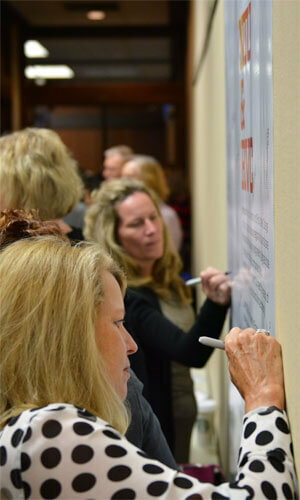 Mike Schabalske, executive director of Transform Rockford, facilitator of a community-driven strategic plan to dramatically improving the social and economic well-being of the city and its residents, said that boosting the skilled workforce is only one positive among many. Families will enjoy a higher standard of living thanks to the improved accessibility of an NIU education. A focus on research will make Rockford a leader in advanced manufacturing and a hub of ideas. Sagar Patel, president of Aircraft Turbine Systems at Woodward and chair of the Rockford Area Economic Development Council, invited other industry owners, business leaders and community supporters to recognize, celebrate and back those possibilities. He’s invited the architects of the NIU-RVC Engineering Program to speak at 5:30 p.m. Wednesday, Aug. 26, when the RAEDC discusses its strategic plan moving forward and highlights the new partnership as a local asset. The event takes place at the Prairie Street Brewhouse, 200 Prairie St. in Rockford. Woodward has pledged funding to encourage full realization of the partnership that represents “a big step we are taking to a brighter future,” Patel said. It matters, he said, because engineering “is the core of everything we do” and “the core of innovation.” Average salaries for engineers are $90,000, he added, while the unemployment rate for engineers is half of the rate for other professions. UTC Aerospace Systems shares that enthusiasm, said Bob Guirl, director of the strategy and development for Electrical Systems. More than half of the company’s Rockford employees are engineers, he said, and 130 hold NIU diplomas. Like Woodward, Guirl’s company will help by providing internships for “bright minds” by opening the doors to its facilities and labs and showing its work to students and professors. Those meetings also will help UTC identify, mentor and retain top talent, he said. Of course, partnerships between NIU and Rock Valley are nothing new. The two schools have been linked for decades, NIU Provost Lisa Freeman said, noting the NIU-Rockford campus, the work of Rena Cotsones (associate vice president for NIU’s Engagement and Innovation Partnerships in Rockford) and NIU’s recent acquisition of EIGERlab as evidence of the university’s commitment. “You don’t get to make an announcement like this because you’re been working together for a couple weeks of a couple months,” Freeman said. 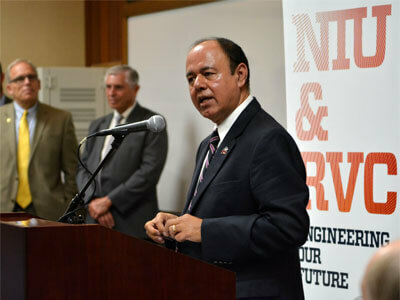 Promod Vohra, dean of the NIU College of Engineering and Engineering Technology, confirmed that Rockford was considered a priority nearly 30 years ago when the college formed in 1986. NIU President Doug Baker signs the declaration. Since then, Vohra said, NIU has supplied the region with hundreds of engineers – “the catalysts of innovation” – who make a difference in the Rockford economy. And, when the college’s assistance was solicited in 2003 to revive the Rockford manufacturing economy, Vohra and his colleagues answered with expertise in process reengineering, product innovation and strengthening the supply chain. That includes not only aerospace but manufacturing, the dean added.